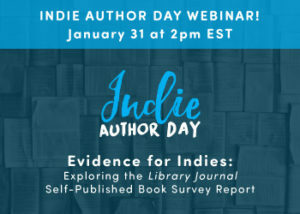 The good folks at Indie Author Day are hosting a free webinar for indie authors on Tuesday, January 31, 2017 at 2 p.m. Eastern time. Drop by and hear about Library Journal’s groundbreaking Self-Published Book Survey Report, a first-of-its-kind study that examines the relationship between public libraries and self-published books. In this free webinar, we’ll be hearing from our own admin, the somewhat illustrious K. S. “Kat” Brooks; as well as Carl Pritzkat from Publishers Weekly’s BookLife; Carla Sarratt of the New Hanover County Public Library; and Kiera Parrott from Library Journal. Just hop on over to this link to register for FREE. We hope to see you there.